To access the live seminar fill out the form. 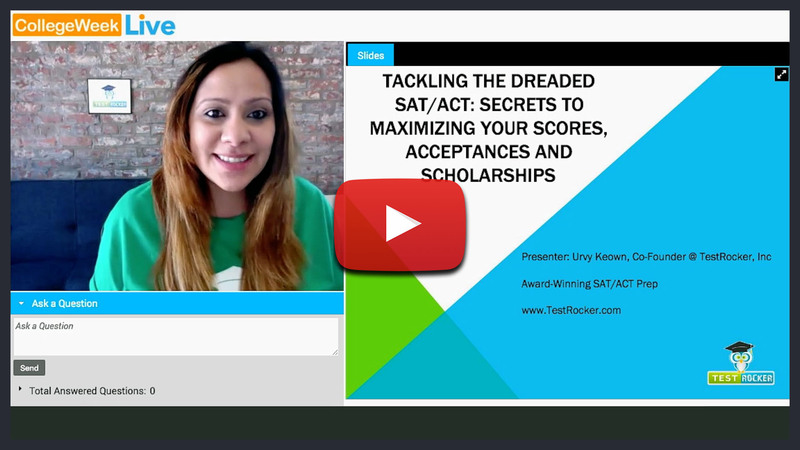 Urvashi Keown, COO & Co-Founder of TestRocker, talks about how to tackle the SAT & ACT. Join us and ask questions, listen in, take notes and learn how to tackle your test! 95% of people recommend TestRocker to a friend. So you CANNOT miss this. - Secrets to maximizing your test scores. - How scores correlate with acceptances. - How to get scholarships to college. - Why you need to take the PSAT seriously. Get access for FREE right now! Just fill out the form. ACT is a registered trademark of ACT, Inc. SAT is a registered trademark of the College Entrance Examination Board.